Will Debt Leverage Leverage Gold? Attention, please! The leverage in the stock market has been recently rising. 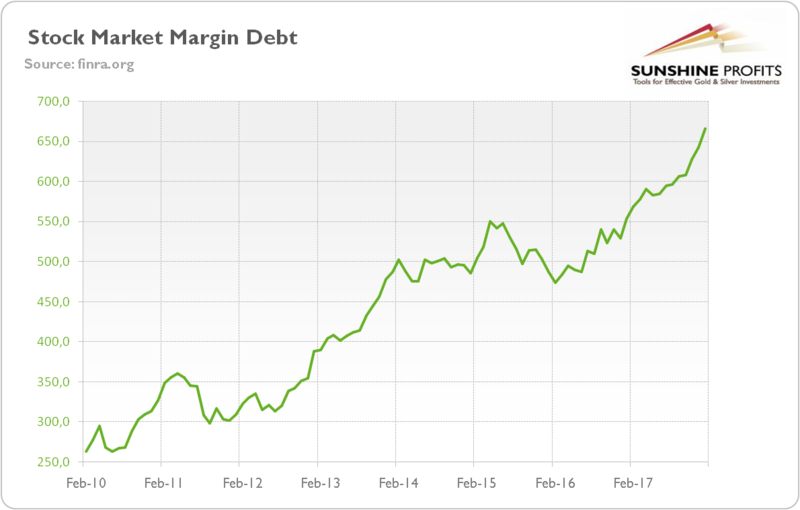 As one can see in the chart below, the stock market margin debt surged more than $113 billion in 2017, one of the largest annual surges. Moreover, it was the ninth annual increase in a row. Chart 1: Stock Market Margin Debt (in $ billions) from February 2010 to January 2018. As a reminder, margin debt is a borrowing against investors’ portfolios – it means that individuals borrow money against their existing stocks to buy even more stocks. Smart way to boost gains, right? Of course, at least until the bears are unleashed and investors receive “margin calls” – the key problem with margin debt is that is works like leverage. It accelerates bull markets, but also the declines. Should we worry about the increase in margin debt, then? Well, yes – and no. The marginal debt spiked both before the dot-com crash and the Great Recession. Moreover, the margin debt increased also relative to the nominal GDP or the S&P 500 Index since the previous peak. But the fact that previous records preceded crises doesn’t imply that we are headed for a collapse now. There were also multiple periods where a bear market didn’t follow after the margin debt peaked. As John Templeton famously said, “Bull markets are born on pessimism, grown on skepticism, mature on optimism and die on euphoria.” The rise in marginal debt certainly indicates the rise in investors’ confidence, but the current bull market is probably the most hated ever. The margin debt has been rising because interest rates are so low, not because investors expect that the market will explode. Actually, margin debt as a percent of the total market cap has generally been flat since the Great Recession. This is why – unfortunately for gold bulls – we believe that although the margin debt may be a red flag, it doesn’t signal the end of world. Technology Is The Outperforming Sector. Is Your Portfolio In Line With That? Can My Portfolio Survive A Crash?